Chicks were diggin’ the long ball today as the Phillies used it to beat the Braves 5-3 and win the series two games to one. Placido Polanco, Jayson Werth, and Shane Victorino all went yard against Braves’ starter Kenshin Kawakami and helped the team overcome a shaky start by Cole Hamels. 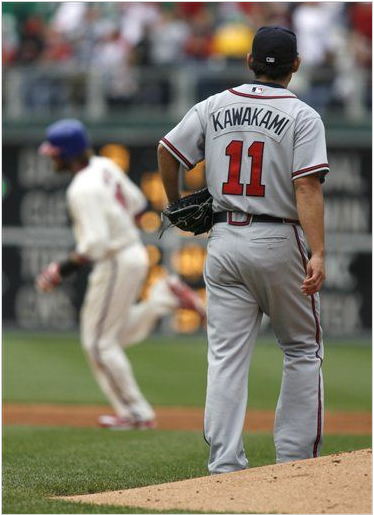 Hamels only lasted five innings, giving up eight hits, three earned runs, and four walks, including one to Kawakami at the top of the fifth to start a three-run Braves rally. He struck out five. The bullpen would be lights out from there, starting with Chad Durbin striking out four in two innings. Jose Contreras played the role of set-up man in the eighth by setting down Matt Diaz, Brooks Conrad, and Nate McLouth in order. Then all of Philadelphia would hold their collective breath as Brad Lidge entered the game to close in the ninth for his first save opportunity of the season. Eric Hinske and Omar Infante would both hit deep fly balls for outs at the warning track that might have been home runs without the windy conditions. Martin Prado would bounce a dribbler to Lidge for the final out. The Phillies completed a successful homestand by winning seven of ten games, and are now two games ahead of the Mets in the division. Tomorrow, the Fightins hit the road for the first of three games against the Colorado Rockies. Kyle Kendrick (1-1, 5.87 ERA ) faces left hander Greg Smith (1-2 6.35 ERA) at 8:40 PM ET. CDTLB Hottie of the Day: Jayson Werth and his magnificent beard not only hit his 100th career home run in the third inning, but also saved a run with a strong throw to Chooch to get Infante out at the plate in the first. Hawt.